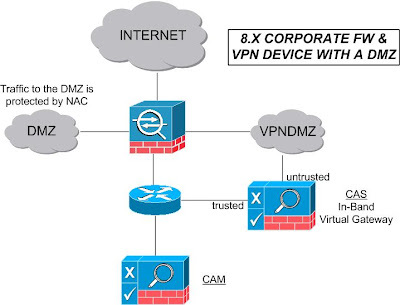 One common design challenge in the past was how to deploy NAC for VPN Users when the VPN device is also a corporate firewall. This entry will hopefully help you understand the existing ways of deploying NAC for VPN Users and also help you understand how to design NAC for VPN Users with ASA 8.X. With this deployment you need to ensure normal internet traffic from corporate users does NOT go through the CAS. 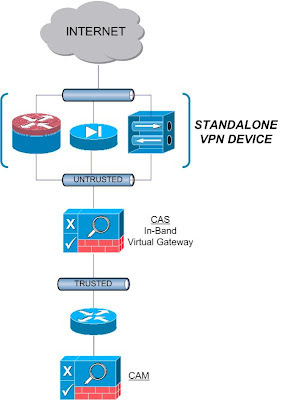 In order to accomplish this, the CAS is deployed using Real-IP Gateway and policy based routing is used on the next layer 3 hop from the firewall to send VPN Users traffic to the CAS's untrusted interface. This is what you all have been waiting for, how does VPN Deployment change with ASA 8.0? 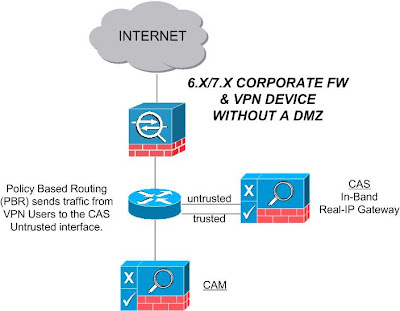 It all comes down to one new feature "Restrict Access to VLAN" (also know as VLAN Mapping). Restrict Access to VLAN—(Optional) Also called "VLAN mapping," this parameter specifies the egress VLAN interface for sessions to which this group policy applies. The security appliance forwards all traffic on this group to the selected VLAN. Use this attribute to assign a VLAN to the group policy to simplify access control. Assigning a value to this attribute is an alternative to using ACLs to filter traffic on a session. In addition to the default value (Unrestricted), the drop-down list shows only the VLANs that are configured on this security appliance. Please note that you must create an DOT1Q trunk and create the VPN DMZ interface using a subinterface for this option to appear. Now that we have a way to ensure VPN users get put onto a specific interface, we are able to deploy the CAS in Virtual Gateway mode and control complete access to VPN Users through NAC. This forces all users to go through NAC before they are allowed to do anything. 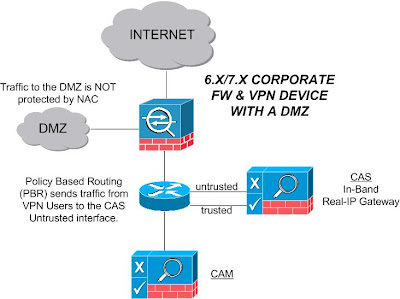 Cisco's ASA 8.0 software has really made deployments with NAC for VPN Users a lot less complex. Utilizing the VLAN Mapping setting on the ASA is only going to open up doors down the road for even better seamless integration of NAC Appliance into your infrastructure.